I do like they done. 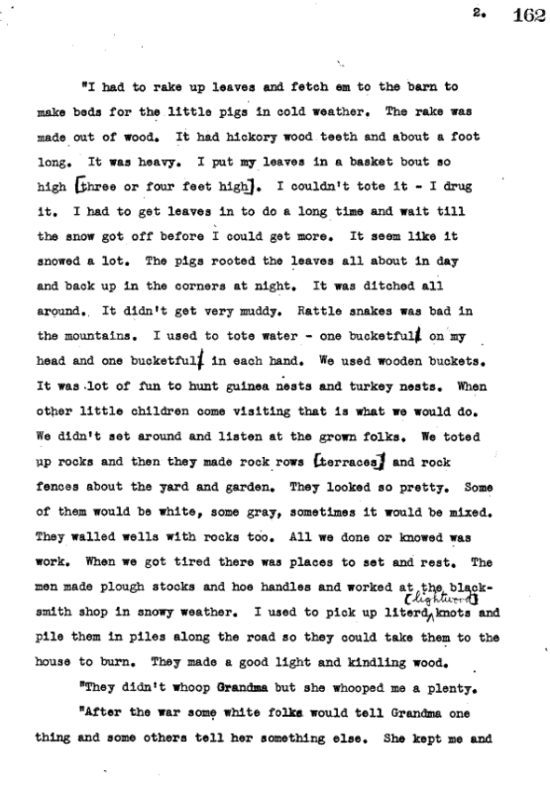 Martha Ann Tyson Dixon of DeValls Bluff, Arkansas, sat for an interview with a Federal Writers Project worker in the late 1930s. Dixon had spent her childhood enslaved near Saratoga, Wilson County, and she and her husband Luke D. Dixon had migrated west in the late 1880s. More than 50 years after Emancipation, she vividly described the hardships of life during and after slavery. “I am eighty-one years old. I was born close to Saratoga, North Carolina. My mother died before I can recollect and my grandmother raised me. They said my father was a white man. They said Jim Beckton [Becton]. I don’t recollect him. My mother was named Mariah Tyson. “I recollect how things was. My grandmother was Miss Nancy Tyson’s cook. She had one son named Mr. Seth Tyson. He run her farm. They et in the dining room, we et in the kitchen. Clothes and somethng to eat was scarce. I worked at whatever I was told to do. Grandma told me things to do and Miss Nancy told me what to do. I went to the field when I was pretty little. Once my uncle left the mule standing out in the field and went off to do something else. It come up a hard shower. I crawled under the mule. If I had been still it would have been all right but my hair stood up and tickled the mule’s stomach. The mule jumped and the plough hit me in my hip here at the side. It is a wonder I didn’t get killed. “I had to rake up leaves and fetch em to the barn to make beds for the little pigs in cold weather. The rake was made out of wood. It had hickory wood teeth and about a foot long. It was heavy. I put my leaves in a basket bout so high [three or four feet high.] I couldn’t tote it — I drug it. I had to get leaves in to do a long time and wait till the snow got off before I could get more. It seem like it snowed a lot. The pigs rooted the leaves all about in day and back up in the corners at night. It was ditched all around. It didn’t get very muddy. Rattle snakes was bad in the mountains. I used to tote water — one bucketful on my head and one bucketful in each hand. We used wooden buckets. It was a lot of fun to hunt guinea nests and turkey nests. When other little children come visiting that is what we would do. We didn’t set around and listen at the grown folks. We toted up rocks and then they made rows [terraces] and rock fences about the yard and garden. They looked so pretty. Some of them would be white, some gray, sometimes it would be mixed. They walled wells with rocks too. All we done or knowed was work. When we got tired there was places to set and rest. The men made plough stocks and hoe handles and worked at the blacksmith shop in snowy weather. I used to pick up literd [lightwood] knots and pile them in piles along the road so they could take them to the house to burn. They made a good light and kindling wood. “They didn’t whoop Grandma but she whooped me a plenty. “cooked right on. I didn’t know what freedom was. Seemed like most of them I knowed didn’t know what to do. Most of the slaves left the white folks where I was raised. It took a long time to ever get fixed. Some of them died, some went to the cities, some up North, some come to the country. I married and come to Fredonia, Arkansas in 1889. I had been married since I was a young girl. But as I was saying the slaves still hunting a better place and more freedom. Grandma learnt me to set down and be content. We have done better out here than we could done in North Carolina but I don’t believe in so much rambling. In the 1860 census of Saratoga township, Wilson County: farmer Nancy Scarborough, 47; Victoria, 10, Susan, 6, and Laurina Scarborough, 3; farm manager Seth Tyson, 23; and Julia, 18, Nancy, 17, Aaron, 15, and Abner Tyson, 13. In the 1870 census of Saratoga township, Wilson County: Mary Tyson, 62, with Edith, 23, John, 21, Abraham, 16, and Martha Tyson, 11. 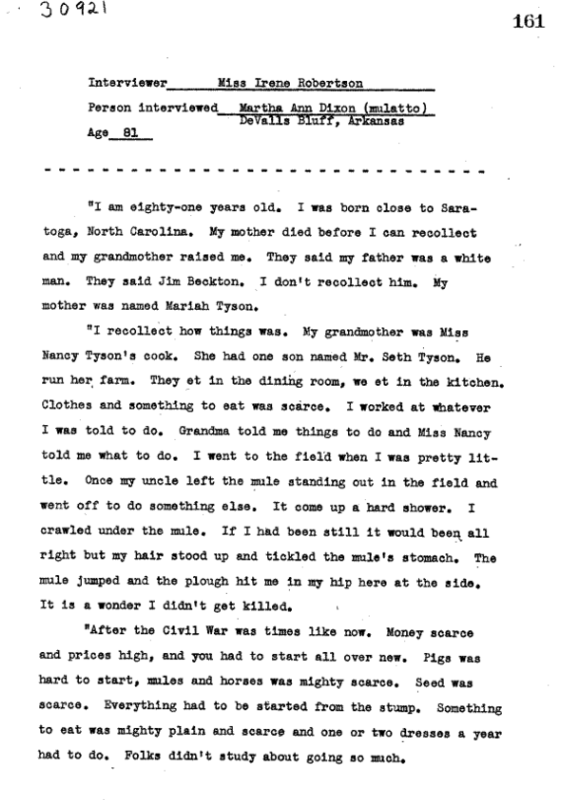 In the 1880 census of Lower Town Creek township, Edgecombe County: Martha Tyson, 20, was a cook in the household of white marchant/farmer Mark Atkinson. Martha Tyson, 26, married Luke Dixon, 26, in Wilson County on 12 February 1885. Minister E.H. Ward performed the ceremony in the presence of Charles Batts, Tempey Cotton and Green Taylor. In the 1910 census of Watensaw township, Prairie County, Arkansas: Luke Dixon, 49, saw filer at Bar factory, and wife Martha M., 52. In the 1920 census of DeValls Bluff, Prairie County, Arkansas: on Cedar Street, farmer Luke Dixon, 58; wife Martha, 59; and cousins Margaret Tyson, 14, and Oleo McClarin, 9. In the 1930 census of DeValls Bluff, Prairie County, Arkansas: on Cypress Street, owned and valued at $2000, Luke D. Dixon, 70, born in Virginia, and wife Martha, 70, born in North Carolina, with cousin Allen Reaves, 8. In the 1940 census of DeValls Bluff, Prairie County, Arkansas: on Cypress Street, owned and valued at $2000, Luke Dixon, 84, born in Virginia, and wife Martha A., 84, born in North Carolina. 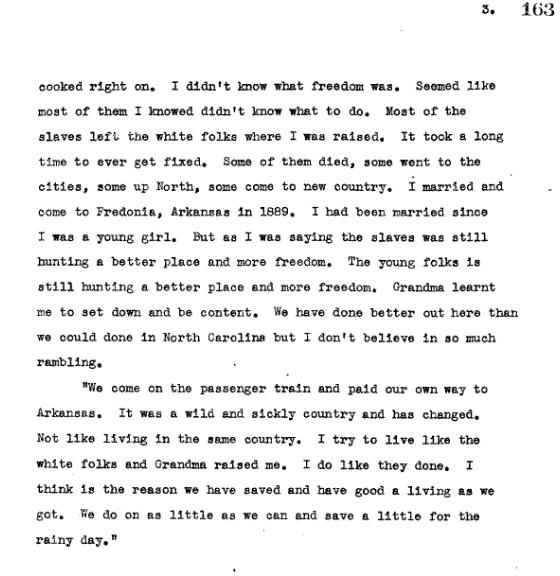 Federal Writers’ Project: Slave Narrative Project, Vol. 2, Arkansas, Part 2, Cannon-Evans, http://hdl.loc.gov/loc.mss/mesn.022.